Astronaut photograph ISS053-E-131276 was acquired on October 22, 2017, with a Nikon D4 digital camera using a 500 millimeter lens, and is provided by the ISS Crew Earth Observations Facility and the Earth Science and Remote Sensing Unit, Johnson Space Center. The image was taken by a member of the Expedition 53 crew. The image has been cropped and enhanced to improve contrast, and lens artifacts have been removed. The International Space Station Program supports the laboratory as part of the ISS National Lab to help astronauts take pictures of Earth that will be of the greatest value to scientists and the public, and to make those images freely available on the Internet. Additional images taken by astronauts and cosmonauts can be viewed at the NASA/JSC Gateway to Astronaut Photography of Earth. Caption by Andi Hollier, Hx5, JETS Contract at NASA-JSC. 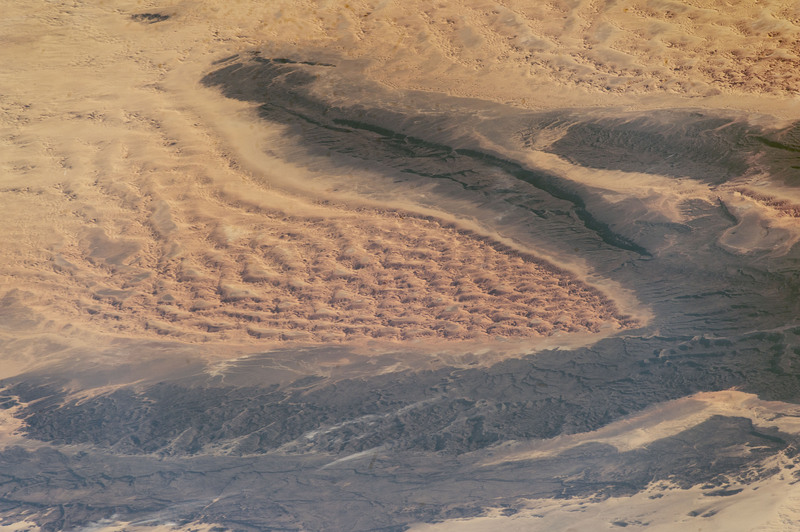 While flying aboard the International Space Station, an astronaut took this photograph of the northwest corner of Tassili n’Ajjer National Park in Algeria. The darker sandstone plateau, Tassili n’Ajjer, curves around part of the Tifernine Dunes—a vast dune field of the Sahara Desert. The plateau stands a few hundred feet above the dunes below. Tassili n’Ajjer translates to “plateau of chasms,” a name that describes the deep fissures and canyons long ago cut into the rock by flowing water. The dune field below took shape after an ancient lake dried up. Tassili n’Ajjer is a UNESCO World Heritage Site with more than 15,000 prehistoric etchings and illustrations on the cave walls; these record a human presence as far back as 6000 BCE. Geologists generally classify dunes into five basic types, and all but one (domes) are found in the Tifernine Dune Field. (Click hereto view a high-resolution photograph of the dunes.) The shape of a dune is an indication of regional wind patterns. In the case of Tassili n’Ajjer, the ridges on either side of the dune field block most of the sand particles from traveling over the plateau. This causes sand to pile up over time such that the dunes are sitting at a much higher elevation in the alcove than elsewhere in the dune field.